Health Secretary Jeremy Hunt has conceded the NHS in England is facing "completely unacceptable" problems. He said there was "no excuse" for some of the difficulties highlighted during the BBC's NHS week and the government had a plan to help hospitals cope. A series of reports has revealed lengthening waits in A&E and patients being left for hours on trolleys. Sir Robert Francis QC, who investigated failings in Mid Staffordshire, said the NHS was facing an "existential crisis". However, in an exclusive interview with the BBC, Mr Hunt said the key was to treat more people "at home and in the community" to ease the burden on hard-pressed hospitals. He said there was already a "big transformation programme" under way, but conceded it would take time. He said: "It is incredibly frustrating for me. I am doing this job because I want NHS care to be the safest and best in the world. That kind of care is completely unacceptable. No-one would want it for members of their own family." He said there were "no excuses" for some of the stories that have emerged this week, including the case of Iris Sibley, who has been left stranded in Bristol Royal Infirmary for more than six months because a nursing home place could not be found for her. "It is terrible for Mrs Sibley but it is also very bad for the NHS," Mr Hunt said. He went on to say it was "completely unacceptable" - the third time he used the phrase when pressed by the BBC about some of the problems that have come to light. Mr Hunt said: "We are trying very hard to sort out these problems." But he admitted progress had been "disappointingly slow" in some areas, including integrating the NHS with council-run care services, such as care homes and home help. However, he added: "Where I disagree with some of your coverage is the idea this is a problem unique to the NHS." He claimed all health systems were "grappling" with similar problems because of the ageing population. "There's no silver bullet," he added. He also took issue with suggestions that it was all about money, pointing out France and Germany, who both spend more than the UK on health, did not do as well as the NHS on 14 out of 35 measures. He said France had struggled this winter with flu, while some German cities had been forced to close their A&Es on "certain nights". Mr Hunt said in England extra money was being put in - nearly £4bn this year, which he pointed out was the equivalent to the whole budget of the fire service. While this represents an increase in the front-line budget of nearly 4% this year, since 2010 the NHS has had much less generous rises than it has traditionally enjoyed. That trend is forecast to continue until 2020. He said tackling social care problems - a major reason why so many frail patients cannot be discharged from hospital - was on the government's agenda. "The prime minister has been very clear. We recognise the pressure's there. We recognise there is a problem about the sustainability of the social care system. "That has to be addressed and we are going to do that." 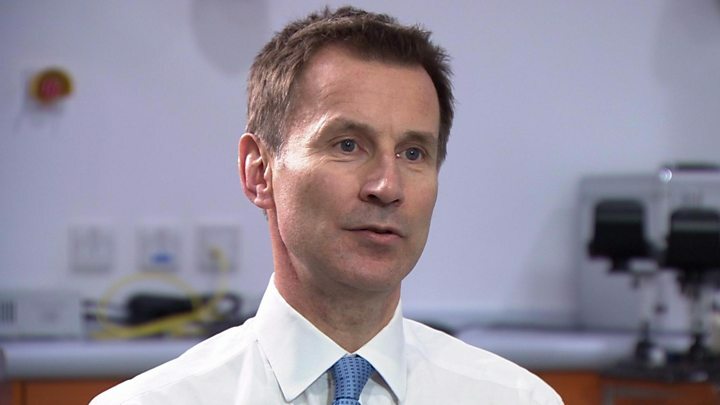 Mr Hunt also said there were "positive" things happening in the health service as well as negative, highlighting improvements in cancer survival and the investment being made in general practice. However, Sir Robert Francis said the financial pressures on the NHS - together with the high levels of demand - had created an environment in which a care scandal equal to Mid Staffordshire was "inevitable". The health service was "manifestly failing" to keep pace with demand, he told the Health Service Journal. Sir Robert, who is a non-executive director at the Care Quality Commission, also warned of "depressingly familiar" pressures on NHS chief executives "coming down from the top." He said there was an "increasing disconnect" between what was said nationally about the NHS and "what people on the ground feel or see is going on". "The message is put out that we are putting more money into the service than we ever did and it is the best health service around. "But against that there is a front-line feeling that things have never been as bad as they are now and we can't deal with the pressures," he added. Labour Shadow Health Secretary Jon Ashworth said: "A few weeks ago the prime minister was glibly dismissing concerns as amounting to nothing more than a 'small number of incidents'. "I'm pleased the secretary of state is waking up to the scale of the crisis." He urged the government to make more money available to put the NHS and social care on a "sustainable footing". A week of coverage by BBC News examining the state of the NHS across the UK as it comes under intense pressure during its busiest time of the year. INTERACTIVE: What's for the chop where you live?